The Batavia Muckdogs today announced the start of their reading program, designed to promote reading amongst the youth of the local communities. Along with the help of New York's 529 College Savings Program, 2017 will mark the fifth year of the "HIT THE BOOKS with the Batavia Muckdogs" reading program. As part of this program, the Muckdogs have provided various schools and libraries across local counties with customized bookmarks. On the back of these bookmarks, children can have a parent, guardian, teacher, or librarian initial each time they complete a book. 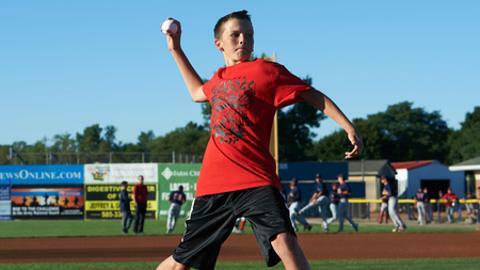 When a child completes 10 books, they can redeem the bookmark at the Dwyer Stadium box office for a FREE TICKET to any Sunday-Thursday Batavia Muckdogs' game! In addition to the free ticket, the child will also receive a prize courtesy of New York's 529 College Savings Program. If a child reads 20 books, they will be entered into a drawing to win a backpack with school supplies, provided by New York's 529 College Savings Program; along with the opportunity to throw out the first pitch at a Muckdogs game. Any questions about the reading program or redeeming for tickets can be answered by Josh Swan, at 585-343-5454 x 1005.